Throughout history, science has changed lives and dramatically altered the way in which the universe is perceived. Focusing on the 100 most significant scientific events of all time--from Archimedes' discovery of the two fundamental principles underlying physics and engineering (levers and buoyancy) in 260 B.C.E. to human anatomy, Jupiter's moons, electrons, black holes, the human genome, and more--storyteller Kendall Haven has created a ready reference for those seeking information on science discoveries. 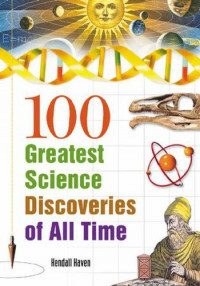 Brimming with fascinating and fun facts about 100 scientific breakthroughs, this collection presents the real stories behind the history of science, at the same time offering a panoramic overview of the history of science and an introduction to some of the most important scientists in history. Grades 6 and up. KENDALL HAVEN is a nationally recognized master storyteller and the author of numerous books, including Marvels of Math, Write Right!, and Close Encounters with Deadly Dangers. A former research scientist, he is based in Fulton, California. Need to get your arms around Microsoft SQL Server 2005 fast, without getting buried in the details? Need to make fundamental decisions about deploying, using, or administering Microsoft's latest enterprise database?